I have always been a sucker for time travel stories but not because I’m fascinated by going back and forward in time and see the world of the past or get a glimpse at our possible futures, but because I like how thinking about time traveling messes with my brain. I’m not very good at physics and time travel stories with a very scientific approach often give me a headache but I really like the challenges those kind of stories provide and I can get very obsessed with thinking about paradoxes and torture my brain with lots of „what if…“ questions that always lead from one problem to another and usually never end up in a flawless and logical explanation – it can be very stressful, but I love it 😀 Another aspect I love about time travel stories is that they often result in alternate universes that are created by the characters’ decisions and actions. The scenarios that I find most intriguing are usually those that share a timeline with the world we know but at some point in the past took a different turn – often just a tiny detail – that created a whole new universe. 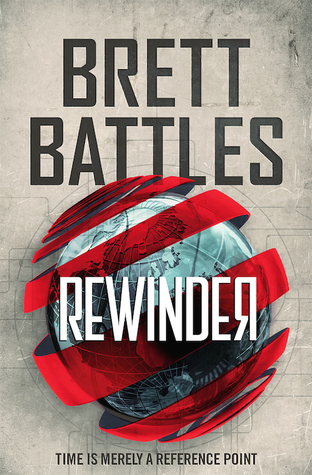 Brett Battles’ novel „Rewinder“ meets both criteria: it’s a book that deals with time travel and not only creates an alternate universe, but is even set in one. Battles’ protagonist Denny Younger grew up in a world where the British Empire has come out as winner from all the major conflicts and wars in the history of mankind and still rules the world in the 21st century. America is not much more than just a huge British colony and so Denny lives in a city called New Cardiff and living in a colony can be tough when you don’t belong to the British aristocracy: the society is divided into different rungs and Denny is a Level Eight, which means he grew up in one of the lowest castes of the system. Since the boy is not a dreamer Denny has accepted that life won’t have a lot in store for him and when he leaves school and takes the compulsory placement examination to sort him into a suitable profession basically all he hopes for is getting a job that takes him away from his uncaring loser dad. But you know how young adult stories work: history nerd Denny exceeds all expectations and gets chosen by the Upjohn Institute, a mysterious and powerful organization that offers him the chance of leading a life full of adventure and wealth he never even dared to dream of. What I liked most about „Rewinder“ though was the exciting plot twist in the middle of the book that changed everything and made Denny’s POV even more interesting but saying more about this would ruin the fun for everyone who still wants to read the book 😉 On the negative side I’m not 100% happy with how the author dealt with time travel in this story because I sometimes had the impression that a lot of explanations were a bit superficial and didn’t always have a very convincing logic. It might be a good idea not wanting to overwhelm a rather young audience with too much science and mind-blowing paradoxes but I occasionally found that some aspects weren’t though-out to the end and therefore led to a few plot holes. But I didn’t really mind because overall I really enjoyed „Rewinder“ since it was a fun time travel adventure and I’m glad there’s a sequel because I think the setting still has potential for more. By the way: Brett Battles’ book also works as a standalone since the main plot gets resolved and it doesn’t leave you with too many unanswered questions, so it’s up to the reader to decide if you want more of this – I definitely do. 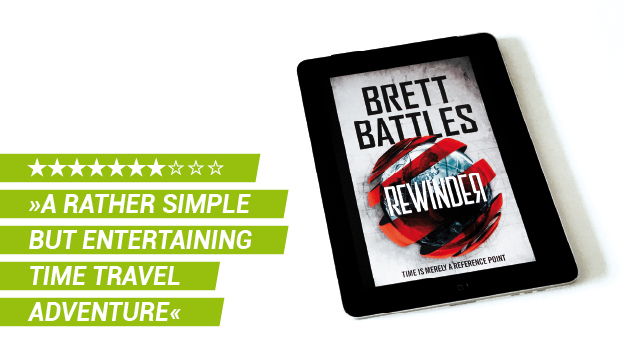 Brett Battles’ young adult novel „Rewinder“ provides an entertaining and exciting time travel adventure that comes with an interesting setting and a likable protagonist – although the time travel aspect is being kept rather simple and doesn’t manage to avoid a few plot holes. Ooh, I really like the idea of a boarding school for time travelers!